At The BBQ Cleaner, we are offering a profitable business opportunity in Mississippi. Whether you are seeking a new career or already running a business that provides services such as cleaning, we have got you well covered. We welcome you to kickstart a new entrepreneurial journey by starting a BBQ cleaning business in Mississippi. You do not have to worry about having to fork out a huge sum or that you lack experience in the BBQ cleaning industry to start such as business. We are offering a tried and tested system that works for aspiring entrepreneurs of all levels. The BBQ cleaning business is easy to set up, operate, and manage. When you work with us, you are not subjected to monthly or yearly royalties. You get to keep what you earn in full! What’s more, you will be able to run your business according to your preferred schedule. Want to work less than two days a week or more? It is up to you to decide! Check out this rapidly growing cleaning business opportunity in Mississippi now! Why Start a BBQ Cleaning Business in Mississippi? Great Summers for Outdoor BBQ: Families in Mississippi feel nothing pairs with summertime like cooking barbecue on a backyard grill. There will be many people needing your grill cleaning services. Easy to Find Potential Customers: Many homes in Mississippi own at least one grill. That’s why you have access to a large base of potential customers to make money from. No Need to Face Fierce Competition: When it comes to BBQ and grill cleaning services in Mississippi, you will not be stuck in a highly competitive niche. Opportunities for Future Expansion: Just like how easy it is to start your BBQ cleaning business, scaling it in Mississippi is easy as well. There is a step by step guide to help you along the way! How Does The BBQ Cleaner Help You Get Started in Mississippi? The BBQ Cleaner is a global leader in the BBQ and grill cleaning industry. Our goal is to help our clients succeed in their own businesses by enabling them to maximize their earning potential when it comes to the provision of grill cleaning services in Mississippi. When you work with us, you will also have access to on-going lifetime business support from us. Since our inception in 1994, we have built a network of more than 180 operators nationwide to date. Lastly, you never have to worry about lacking in any marketing materials because we can provide them when you need them the most. 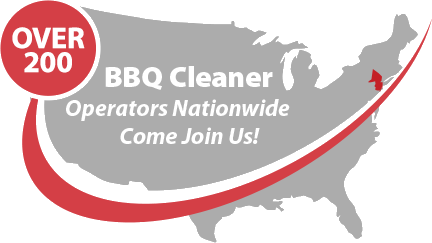 Talk to us today to find out more about this stellar BBQ cleaning business opportunity in Mississippi!